This comparison is a little unfair. It’s a little like comparing the ‘value’ or ‘basics’ product against the ‘Premium’ or ‘Exclusive’ product. Its equivalent to comparing a basic Ford Fiesta to the Ford GT40 race car. Both are excellent toothbrushes in their own right providing a great clean. The Pro 1000 sets a high bar for the price, but the 7000 is considerably more appealing, it’s just you pay for it. At the time of writing, some £105. Furthermore, neither of these brushes are among the most current UK brushes available. There are better and cheaper options available, which we cover in our list of the most recommend brushes for 2019.
he Pro 1000 has 1 cleaning mode (Daily Clean) compared to the 6 of the Pro 70000 (Daily Clean, Gum Care, Sensitive, Whitening, Deep Clean and Tongue Cleaning). The Pro 1000 comes with 1 x CrossAction brush head included whereas the Pro 7000 comes with 1 x CrossAction, 1 x 3DWhite and 1 x Sensitive brush head in the box (Other versions/configurations of Pro 7000 exist). The Pro 7000 has a 10 day/40 minute battery life compared to the 7 day/28 minutes of the Pro 1000. The Pro 7000 has a premium travel case and travel pouch. The Pro 1000 is all White, Black and White or Blue and White in colour compared to the 7000 which is available in all White or Black/Silver colour combinations. The Pro 1000 is generally the cheaper of the two. The word Pro and Smart Series are used interchangeably when followed by the 7000 model number. This is because both names apply to the model. 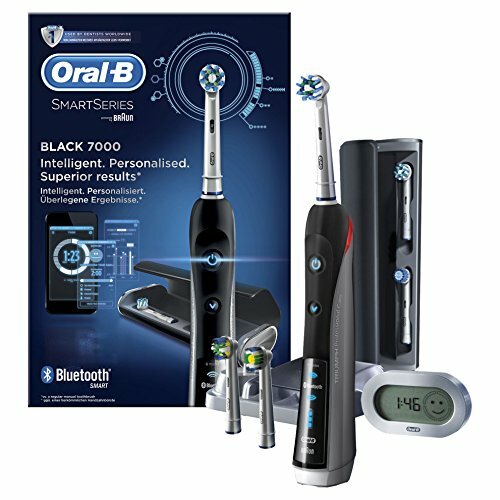 It’s the same thing, but there has been a bit of a re-branding exercise that has taken place, so where once named only the Pro 6000, it is now a bit of a combination as Oral-B try to make consideration for the Bluetooth connectivity that it offers, hence the Oral-B Pro 7000 SmartSeries electric toothbrush. Whilst available in the UK through select sellers, the Pro 1000 is a model that has been manufactured and packaged for the US and other select markets. It has not been officially launched in the UK. The UK equivalent is the Pro 600 which is essentially the same brush under a different name. The Pro 7000 mentioned in this comparison is the US version too. There is a UK variant of the Pro 7000 which is very similar but does the most smallest of differences in box contents, you get a travel pouch included. Despite the differences, even if comparing the UK variants, the same conclusion would be drawn. Do be aware of this when purchasing the 1000 or 7000 (if US model) the power adapter supplied will not be correct for UK sockets unless an adapter is provided by the seller. You would not have this issue with the Pro 600 and UK variant of the Pro 7000. Detailed Comparison: What’s the difference between the Oral-B Pro 3000 and Pro 7000? As I outlined in the outset, there are quite a few differences between these two brushes. The big advantage you get with the Pro 1000 is value for money, in fact the 7000 offers reasonable value for money, but as you spend more you don’t get quite as much for every $ spent. Lets look in a bit more detail on what makes these two brushes stand apart. Let’s start with how they look. The physical size of these two brushes are different. Most notably this is because they contain batteries with different capacities. The 1000 has a 7 day battery life, compared to the SmartSeries 7000 that has a 10 day battery life. Using the standard Daily Clean mode this is a usage time of 28 and 40 minutes respectively. The 7000 is better for families or travellers as a result, but the battery life is not as good as some competing products. Aside from the battery that makes them physically different, the 7000 has a different icon configuration on the front. While both show battery power, on the 7000 the battery is broken down into 3 sections and the front panel also shows the wireless icon for the Bluetooth. On the 1000 to turn the brush on you have a single power button. On the 7000 there is a power button but an additional button for cycling through and selecting the appropriate cleaning mode. The heavier and wider SmartSeries 7000 feels solid in hand, and perhaps better for those with limited dexterity, but the 1000 wins for a smart compact feel in hand. The 1000 has a rubber strip that runs down the front of the brush for grip and style. The 1000 comes in 3 colour options all White, Blue and White and Black and White. The rubber on the front is what changes in colour, the sides and rear of the handle is always a gloss white. On the Pro 7000 it comes primarily in a Black colour option and has rubber on the rear of the handle rather than plastic. It is a slightly more matte Black than on the 1000. There are silver panels on the right and left side that make it look smart and stand out. There is an all white colour option for the 7000 but this is generally a lot more expensive and not sold as widely as the Black colour option. Another small design difference, but one that is actually a useful feature is on the upper neck of the handle, it is a red plastic panel which is the pressure sensor. Found on the 7000 only, this panel illuminates a bright red thanks to an LED inside, when too much pressure is applied to the teeth when brushing. Both brushes have a sensor built in that will reduce the power delivered to the brush head until the pressure is reduced, but it is the 7000 that has the visible pressure sensor. If the pressure sensor is illuminated, simply reduce the pressure put on the teeth and the light will go off. Both brushes do a good job of brushing your teeth. Both will remove more plaque than a manual brush and leave your mouth feeling fresh and clean after each use. Technically, the Pro 7000 delivers a little more power via pulsation on the Daily Clean mode, but noticing this or telling the difference is essentially impossible. I wished to mention it for the record, but the reality is, it makes little difference. What makes the 1000 appealing is the simple no nonsense approach of having just 1 cleaning mode. The 7000 has the same Daily Clean mode but also has Gum Care, Sensitive, Whitening, Deep Clean and Tongue Cleaning. All of these work slightly differently to achieve different results. Not all of us need these extra modes, but they can bring benefits if you suffer from sensitive teeth and gums particularly, thanks to the reduced power options. Modes like Deep Clean run for 3 minutes compared to the normal 2. Whilst Tongue Cleaning runs for just 20 seconds at a lower power. You may wonder why a tongue cleaning mode; however this is something many of us overlook. It wasn’t until I really researched the best tongue scrapers, did I realise how much bacteria the tongue holds. A handle like this works well in a family environment with multiple users, all who may have different requirements. If you simply want to brush your teeth and have done with it, then consider the 1000 or one of the lesser featured models than the SmartSeries 7000. Packaged with the 1000 is a single CrossAction brush head. Whereas the 7000 comes with the same CrossAction but 1 x 3D White and 1 x Sensitive brush head. The additional brush heads are included to work with the different cleaning modes available on the brush. 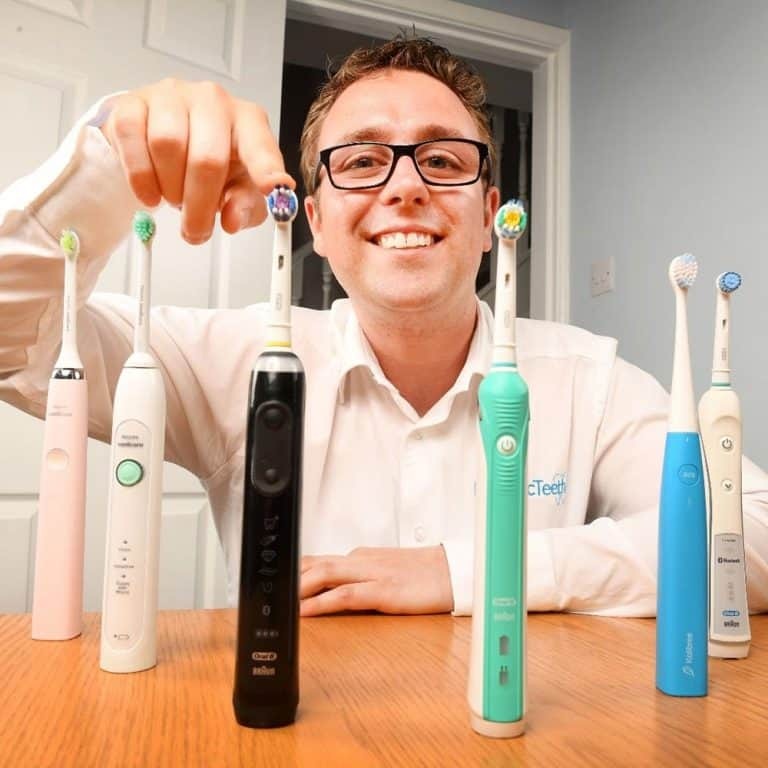 Oral-B offer 6 different styles of brush head that will work with either model, but some heads are better suited to certain cleaning modes as explained in this article. You can purchase any of the different styled brush heads at any time. To accommodate the additional brush heads, the Pro 7000 comes with a storage tray/compartment. Holding up to 4 brush heads it has a lid that stops any splashes, but still allows for ventilation. It is well designed and works well. This storage compartment has also a cutout for the charging stand to fit into, for a neat countertop installation. As you might expect the Pro 7000 is the more expensive of the two due to the features an extra contents that is included in the box. Some of that extra value is best represented in the following extra features. Included in the box is what is referred to as the Wireless SmartGuide. It is a small clock and acts like this until the brush is turned on. At this point the screen changes to show graphically what cleaning mode you have selected, how long you have been brushing for, how well you are doing via a star rating and sad or smiley face as well as a quadrant icon that highlights which quadrant you should be brushing as the time passes. Powered by 2 x AA batteries, this is a gadget you do not appreciate the value of until you don’t have it. It reminds you how long you have been brushing for and is a good stimulus when you get distracted. It also provides that visual feedback to brush for the right time. Overall it is a great aid and should be included with more brushes, in my opinion. This little SmartGuide is great, but the 7000 does also boast a more cutting edge technology that is more fitting of the digital age we live in. Bluetooth enabled, you can connect the 7000 to your Android or iOS smartphone. The fundamental principle is that the app shows you in real time how well you are cleaning, like the SmartGuide does, but it then logs it, so you have a digital record of your cleaning. This can be helpful in achieving you goals. You can also complete some brush customisations via this too. Such connectivity is not for everyone and will appeal to the younger generation more, but it is a novel feature that works. The last major difference between these two models is the travel case. The 1000 is travel case free, meaning you need to buy one, or you need to pop it in your washbag. Provided with the 7000 is what Oral-B refer to as a premium travel case. It is not the most premium option that they offer but it is better than the basic. It holds the brush and 2 brush heads, it is well constructed with a soft touch finish and feels robust. It is also colour matched to the brush, with a black colour to it. The travel pouch is ideal for keeping the charger protected when travelling or any other items you might want to include. The whole design is fitting to the brush and the premium price it commands. That then is the key differences explained. Both share the same charging stand and both have a 2 year warranty. No not in my opinion. Whilst technically the 7000 can deliver more power and has more cleaning modes, it does not necessarily mean it cleans better. The different modes give it extra functions which make it better suited for different users. I would suggest that the 7000 brings conveniences and can assist with better oral hygiene routines, with modes such as the tongue cleaning option. It could be argued that someone with sensitive gums might get a better clean with the 7000 on the Sensitive cleaning mode than the might with the 1000’s only Daily Clean mode; but that would be only because of the reduced power it delivers and not because the brush head or motor works in a way that is different enough to effect the clean. To help ensure you get the best clean from any brush, make sure you have the right technique. This handy guide on how to clean your teeth properly will help direct you through it. It might too be a bit of a stretch and really seeing or tracking a better clean as a result is very difficult. However, the Smart Wireless Guide and Bluetooth connectivity can help you in my opinion, clean better. As you would expect, the extra benefits of the Pro 7000 do not come for free. Roughly speaking there is £105 difference between the two. Yes the 7000 does offer a lot of extra box contents and features, but do you need them? Have you ever desired a whitening mode? Do you travel a lot? Are you using this brush yourself or sharing with other family members? There are the sorts of questions you have to ask yourself. This is not a small difference in price, but for the extra benefits, it could be justifiable if you answered yes to all or some of these questions. The SmartGuide in my eyes is worth £20 alone, if not more. It is not uncommon, despite the 7000 being the more expensive for it to be subject to more promotions and special offers, so time it right and you might just get a deal. Answering this question accurately relies on me having a better understanding of what it is you want and need. At the start of the comparison I made the suggestion that the 7000 was my choice and it still is. It is a fantastic all round package. As good as it is, there is no point paying all the extra money if you won’t be using the extra features and benefits its brings. What are you comfortable spending?